"A heart-stopping thriller in the long-running Sigma Force series..."
Commander Grayson Pierce returns from a night out with his best friend, Monk Kokkalis, to a nightmare. His home has been attacked, Monk's wife, Kat, has been seriously injured, and Seichan and Monk's two young children are missing. Meanwhile, Maria Silviera has made some advances in artificial intelligence that everyone wants to get their hands on - and someone was willing to kill regarding it. Is it a terrorist group or some ancient organization dating back to the Spanish Inquisition? Gray and the rest of the Sigma team will have to use every weapon at their disposal, including some advanced and untested neurological treatments, if they are to have any hope of saving Seichan and Monk's children while stopping worldwide destruction. 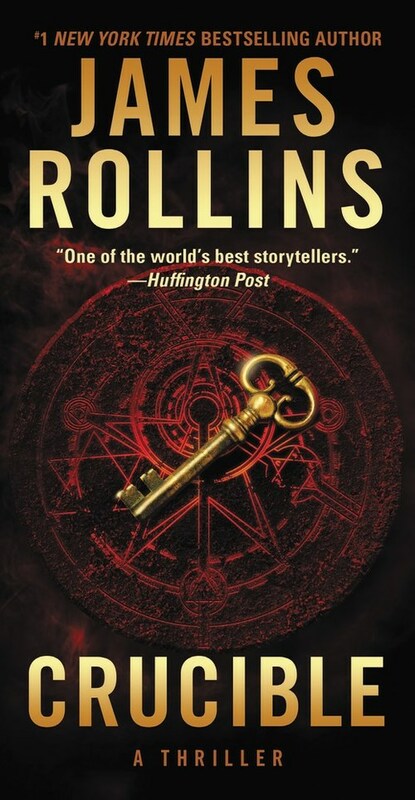 I love how James Rollins manages to combine the Malleus Maleficarum with cutting edge artificial intelligence and neurological technology in the same novel. CRUCIBLE has so many twists and turns that it's hard to explain the storyline without giving away anything. However, the philosophical questions raised by CRUCIBLE are almost as fascinating as the adventure itself. CRUCIBLE is one of those novels that stays with you long past the last page as you ponder the various aspects of the tale. CRUCIBLE is the fourteenth book in the�Sigma Force�series. James Rollins provides enough of the back story so that new readers can jump in and appreciate most of the nuances of the storyline. However, each adventure is so much fun that I can't imagine not wanting to read each and every one! If you're looking for an intriguing and heart-stopping thriller, then CRUCIBLE may be exactly what you need. Arriving home on Christmas Eve, Commander Gray Pierce discovers his house ransacked, his pregnant lover missing, and his best friend�s wife, Kat, unconscious on the kitchen floor. With no shred of evidence to follow, his one hope to find the woman he loves and his unborn child is Kat, the only witness to what happened. But the injured woman is in a semi-comatose state and cannot speak�until a brilliant neurologist offers a radical approach to "unlock" her mind long enough to ask a few questions. What Pierce learns from Kat sets Sigma Force on a frantic quest for answers that are connected to mysteries reaching back to the Spanish Inquisition and to one of the most reviled and blood-soaked books in human history�a Medieval text known as the Malleus Maleficarum, the Hammer of Witches. What they uncover hidden deep in the past will reveal a frightening truth in the present and a future on the brink of annihilation, and force them to confront the ultimate question: What does it mean to have a soul?